Create this fun card and amaze your friends and family, simply pull the slider to watch the colours magically appear! 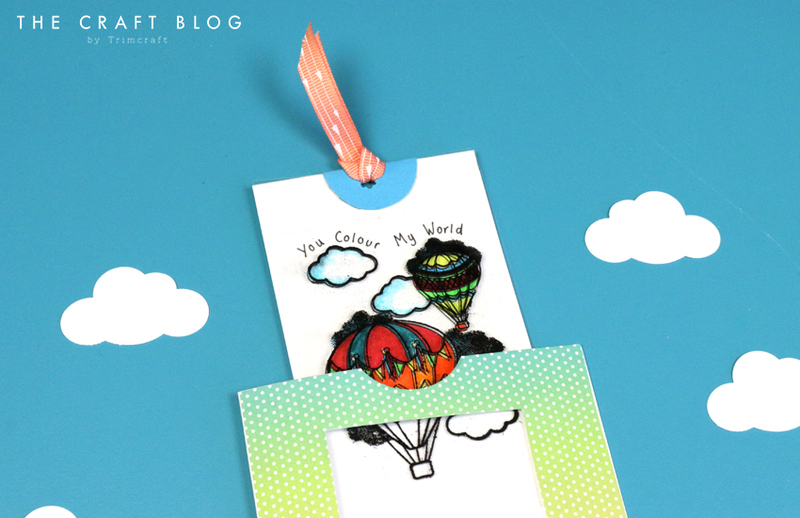 For kids and adults alike, this is a fascinating, interactive card to receive and we’re sure that you’ll really enjoy this DIY. What’s great is that this card really can be used for any occasion and you can even add your favourite sentiment to the inside panel of the card to be revealed as the slider is pulled. Today, Maxine is take you step-by-step through this project and you can find our tutorial below! 1.Cut a 23cm x 14cm piece of cardstock and score it at 11.5cm. 2. Cut an aperture in the front, leaving a 2cm border at the top and bottom and 2.5cm on each side. Cover the front with a sheet of the Simply Creative Razzle Dazzle paper and cut out the aperture. 3. Cut a half circle at the top of the card using the Fiskars large circle punch. 4. Take your chosen stamp and stamp the image onto a piece of cardstock using the We R Memory Keepers Precision Press. 5. Colour the image with your desired medium and then cut the image out to 7.5cm x 13cm. 6. Stamp the image onto the acetate, using the Precision Press to stop it slipping when stamping. Use an ink pad suitable to be used on acetate (i.e. Stazon). 7. Using a heat tool, heat emboss the image. Tip: Use a tumble dryer sheet to wipe over the acetate to help to remove as much static as possible for a clearer image. Tap the back of the acetate to remove any loose powder from around the image and you can also use a fine paint brush to help remove any powder from around the image. 8. Place the acetate over the image on the card and line both up. 9. Add a small piece of tape to the top centre of both sheets to hold them in place. Carefully cut the acetate to the same size as the card, being careful not to move the acetate. 10. Cut a piece of cardstock to 28cm x 10cm. Score across this at 14cm and then fold the cardstock in half. 11. Place the image on top of the folded cardstock with the fold at the top. Mark a line each side of the image and draw a line across, then cut this section out as shown below. 12. Cut a thin strip of card slightly wider than the image. Adhere to the bottom of image on the card section only, not the acetate. This acts as a stopper to prevent the slider being pulled out of the top of the card. 13. Place the image in the middle of the piece of card, with the acetate on the outside. 14. Punch a circle to adhere to the top of the acetate, fold in half and adhere to either side of the acetate sheet and the sheet with the stamped design on. 15. Punch a hole in the centre and thread the ribbon through, making sure that you don’t punch through the folded cardstock. 16. Take the card blank that you created in steps 1 – 3. Place Perma-Fix tape around the inside edges and then place the image into the middle of the card, lining it up the aperture. Close the card blank, adhering the front and back together and sandwiching the slider part of the card inside. Make sure the slider is not touching the tape at the sides. Your sliding card is now complete! Pull the ribbon to reveal your coloured image. What an exciting card for any recipient to receive! You can add your message to the back of the card, or decorate the outside any way you like. Just be careful not to adhere any embellishments to the acetate as this will obstruct the slider. What do you think to this fun Magic Sliding Card? Will you be giving this tutorial a go yourself? If you do, make sure to upload it to the Inspiration Area and to #Trimcraft when sharing on social media. We’d LOVE to see what you create! This is a wonderful tutorial, thanks sooo much, and I´m definitely going to try it later in the year, as my 2 granddaughters are always competing a bitidea for their birthday, so it´s nice with some new ideas here now.